We hope you all enjoyed your holidays and ringed in the New year in style. This year we bring back RegiftTO for it’s 2nd year. 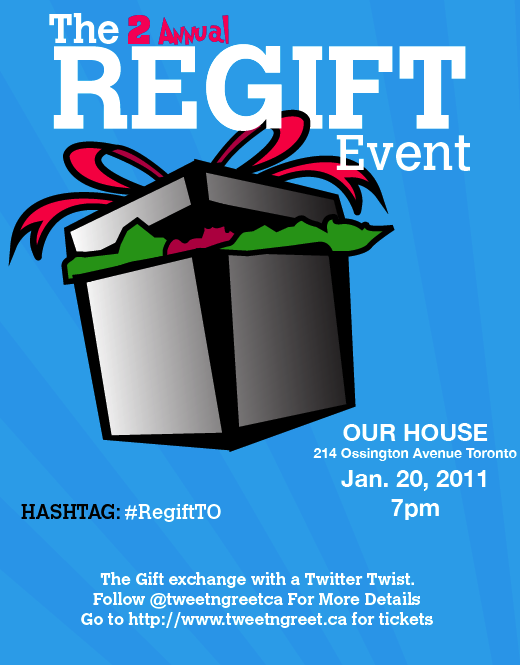 Please join us on Thursday January 20, 2011 and bring a wrapped unisex gift to be exchanged with fellow Twitter friends. More details to come. Please be advised that the Gift Opening portion will commence at approximately 9-9:30pm. Please make sure to bring a wrapped/gift bag unisex gift with a min. value of $5 and up. More details to come and continue to visit this site for details or follow @tweetngreetca for any questions. So this is probably a bit random but hey random can be fun so here is a little ditty that I decided to make. I know totally cheesy but who doesn’t love some every now and then. How to responsibly re-gift through the year – here By Alison Griffiths of the Metro, so how big is your re-gift pile? Wait, So we don’t have to be inconspicuous about regifting? Hey Everyone, I’m Crystal (@CrystalGibson) one of the many organizers for TweetnGreetca. I hope everyone had a fantastic holiday and rang in the new decade in style. The beginning of a new year brings the dreaded (yet almost unavoidable) ‘New Year’s Resolutions’. Luckily a few of mine tie in nicely with #RegiftTO. Firstly, I need to DE-CLUTTER. I just recently moved into a condo, so I’m trying to get the hang of living in a much smaller space. Christmas left me with boxes, decorations and unwanted gifts that I need to deal with now. I promise my gift won’t be fruitcake or the fleece socks – I’ve got some good stuff to bring to the event! Next, I want to meet as many new people as I possibly can. It’s so awesome communicating with everyone on a social media level – but I read a post by @Renee3 the other day where she said: ‘Just realized that I sent my entire holiday with peeps who aren’t on twitter. The kind that pick up the phone to get in touch. It was NICE!’ Ah! I didn’t know this kind of communication existed anymore but I wish it did…a lot more. So, I’m really excited to attend every awesome mixer there is and make some more friends! So, I hope to see you all at Spice Safar on January 15th with your wicked awesome gift. You only have to wrap one gift. Imagine how many hours it took to wrap all the items in the video. Enjoy! If you came out this past Sunday to our first Tweet ‘n Greet at Aice Fazooli’s, you’ll know it was a fantastic evening. As tweeps started showing up, they sauntered over to a table and wrote their Twitter username on a name tag and donned the accessory all night! It was super awesome meeting everyone in person, especially since some were completely different than they looked in their avatars. There was plenty of awesome feedback and we were pleased with how this event turned out (after all, it was our first one). We definitely plan on doing something like this in the near future and hope (if you were there) you’ll tell your friends and bring them along next time. We look forward to building on the connections. Please feel free to comment. We love the feedback. Here are some Networking tips for you to read! It is about meeting people and finding out how you can help them or they can help you. It is NOT just about how you alone can benefit. Prepare ahead by asking yourself: who do you want to meet and what you would like to achieve from the networking event? Many people love to talk about what they do, so take the opportunity to listen and learn. You might just find out how you can work together with them. Present your thoughts and ideas clearly. Make the effort to follow up promptly after meeting the person you want to get to know. Drop him a note or an email within the same day, if possible, to make a first impression that lasts. Thank the person who gave you a referral. A little gesture goes a long way. It is not the quantity, but the quality of contacts that the group can offer you. Get to know them first, and vice versa, before giving them your card. Before you know the other party’s opinions, stay within neutral territory with yours, so as not to put yourself in a potentially awkward situation. Don’t turn aside compliments – that insults the giver. Acknowledge the person by saying “Thank you”. Be patient. It usually takes a while before people are comfortable enough to offer you a referral.